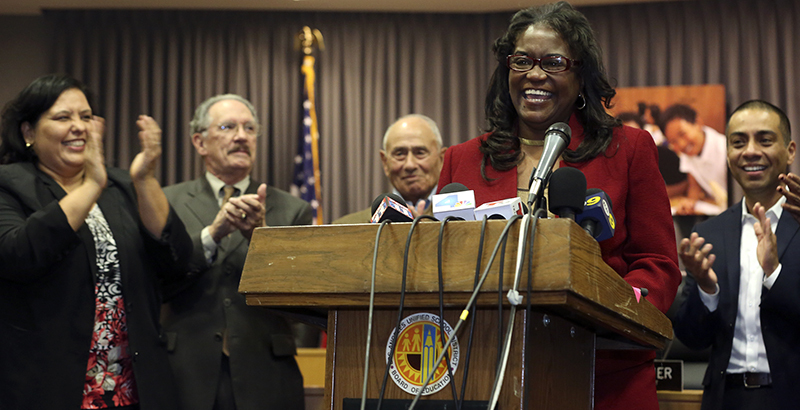 Michelle King, who, as the first female African-American superintendent of the Los Angeles Unified School District, championed unity and collaboration among all public schools, has died of cancer at age 57. Just weeks after her January 2016 appointment, King told a crowd of about 700 parents, teachers, and principals at a town hall meeting that from the moment she was named, she wanted to find ways to share best practices among educators in traditional district schools, independent charter schools, and the district’s innovative magnet and pilot schools. In a fall 2016 interview, King described herself as a district “lifer.” She spent her entire career in the district and attended its schools, even working as a teacher’s aide while a student at Pacific Palisades High School. She was promoted to a coordinator for the math, science, and aerospace magnet at Wright Middle School in Westchester and then served as assistant principal and principal at Hamilton High School in Cheviot Hills. She then joined the ranks of L.A. Unified administrators as head of the division of student health and human services, interim chief instructional officer for secondary education, and superintendent of a western and southwestern region of the district. She was chosen by Superintendent Ramon Cortines to be his chief of staff. She served as deputy superintendent under John Deasy and was named chief deputy by Cortines in October 2014, when Cortines came back to the district to replace Deasy when he resigned under pressure. As she moved up the ladder, she said, people began asking her if she had thought about becoming superintendent. Once her daughters graduated from school, she gave it more serious thought, though she imagined she might have to leave L.A. Unified to do so. 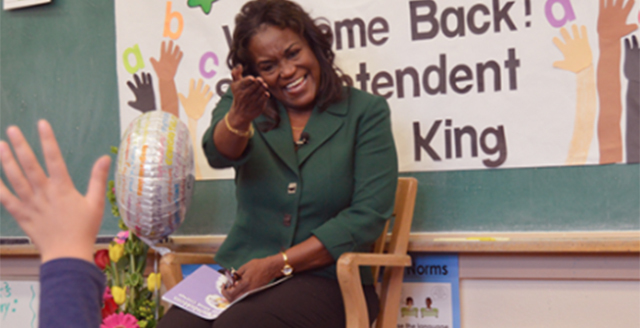 In her first year as superintendent, King visited about 100 schools on a “listen and learn” tour to hear from students, teachers, and parents. Steve Zimmer, who was then president of the school board, told King eight months into her tenure that teachers had more confidence in her than in any other superintendent he had worked with in his 17 years in the district. King’s commitment to collaboration was seen in her joint announcement in September 2016 with Myrna Castrejón, who was executive director of Great Public Schools Now, of up to $3.75 million that would be available in grants for high-performing district-run schools. After the teachers union objected to some programs receiving the funds, $1.5 million was spent to expand the programs of two South Los Angeles schools — Diego Rivera Learning Complex Public Service Community School and King/Drew Magnet High School of Medicine and Science. Both have had long waiting lists. Castrejón said when the grants were announced that replicating high-performing schools had not been attempted in Los Angeles before or anywhere in the nation at the same scale. She said the grants were possible after she and Great Schools staff worked with King in a collaborative and open process.